The Face Shop was having another one of their Buy 10 Get 5 Free promotions for sheet masks, and of course I had to pick some up! I do love a good face mask, especially since I’m upping my skin care routine in time for back to school season. The sheets are typically $2 each, but with the promotion they work out to about to about $1.33. 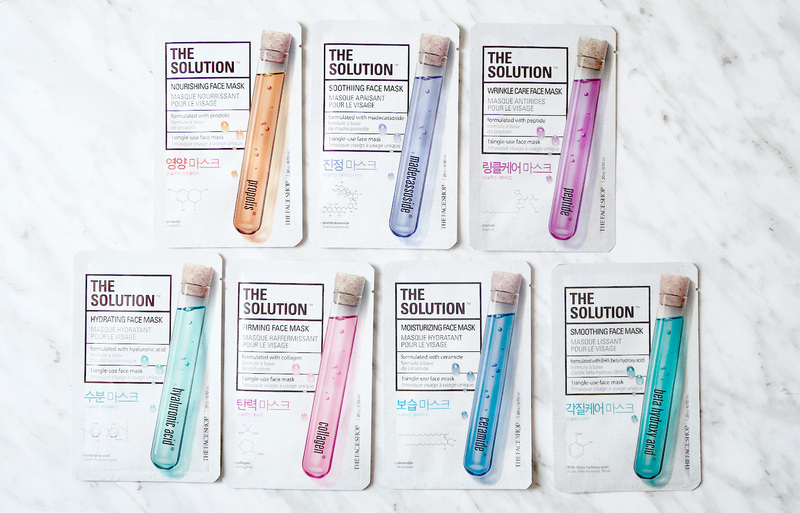 I picked up one of every The Solution masks that were available at my local TheFaceShop store. I believe there are a few other types available on their website as well. I absolutely love this line (big surprise), and a few key things stood out to me right away. First of all, the packets themselves have a bit of a papery texture, which makes them easier to tear open than the regular plastic ones. The masks themselves are thinner and smoother, and feel more absorbent on the skin than goopy with product. They adhere better to the face, and don’t slide around as much! I have seven of the masks to share with you today! 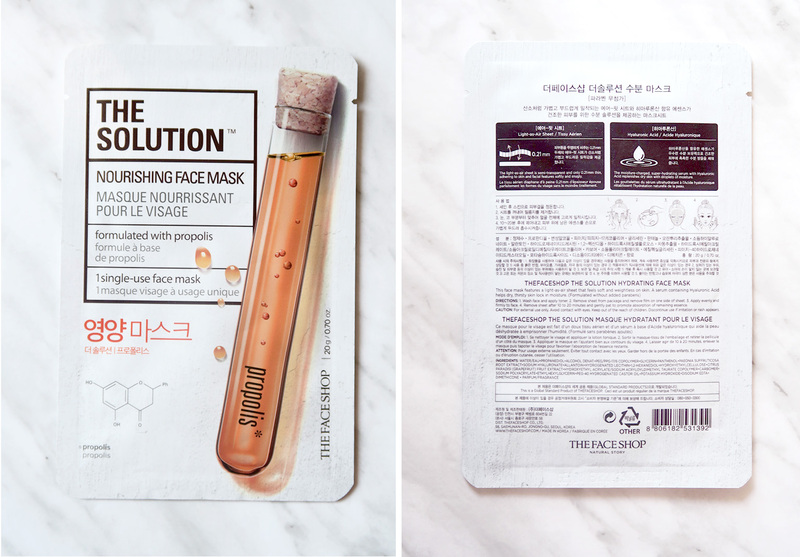 The packaging and design are really cute, and each mask has a main ingredient that targets a specific skincare concern. Soothing Solution Sheet Mask – serum contains Madecassoside to provide a soothing solution to sensitive skin. Wrinkle Solution Sheet Mask – serum contains Peptides to provide a wrinkle care solution. 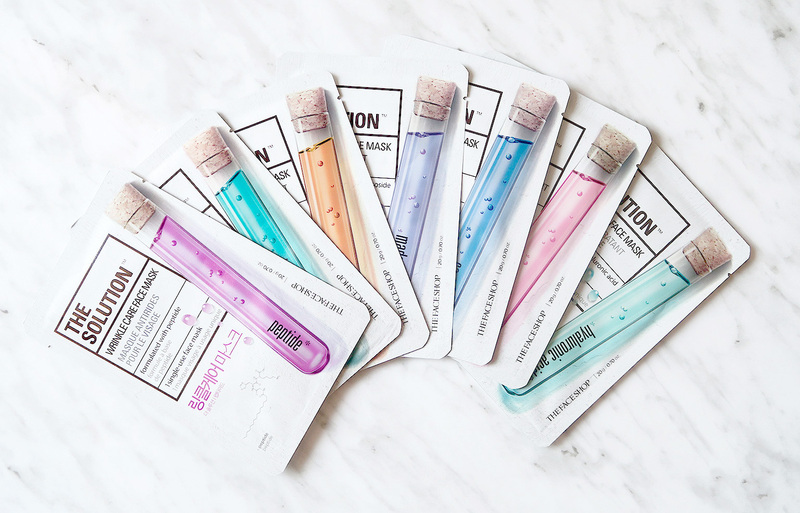 Hydrating Solution Sheet Mask – serum contains Hyaluronic Acid that helps dry, thirsty skin lock in moisture. Firming Solution Sheet Mask – serum contains Collagen to provid a resilience solution to saggy skin. Moisturizing Solution Sheet Mask – serum containing Ceramides provides a moisturizing solution to dry, rough skin. I decided to try out the Propolis solution sheet mask – it comes in the orange package and aims to nourish the skin. I didn’t feel any ~nourishing~ effect (it’s a single use sheet mask, so obviously not,) but maybe with continued usage you’d start to notice a difference? It was moisturizing, and absorbed quickly into the skin after I peeled the sheet off. The scent was light and floral, which was pleasant and unobtrusive. I have since used most of The Solution sheet masks and and I haven’t really noticed anything significant. They are nice sheet masks either way because of the fabric cloth and lack of gloopiness (creative vocabulary, I know). For that reason, I like them more than The Face Shop’s Real Nature line. They make your skin feel hydrated and moisturized afterwards, which is a real treat for dry skin. I don’t think the different….(flavours? Scents? Types?) – Really matter, they all have a similar result. You would have to use a certain type for an extended amount of time to test it out. You can find them at The Face Shop, or online here. Have you tried any of The Face Shop’s masks before? Which one is your favourite? 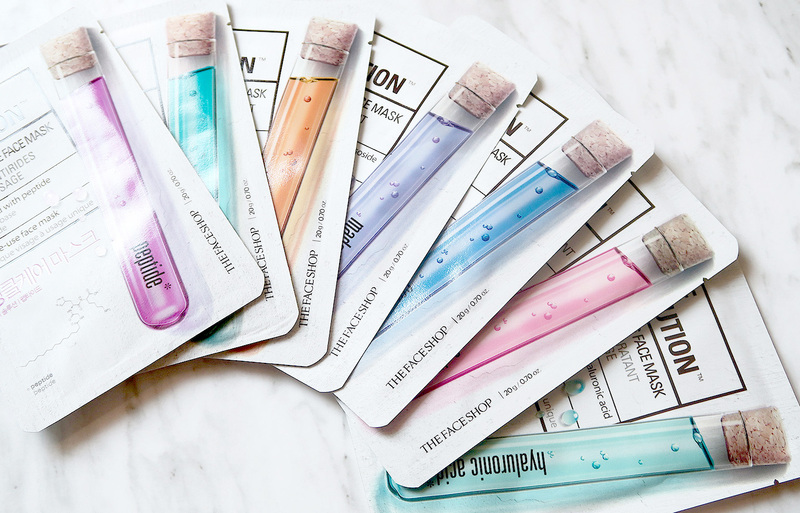 Do your skincare needs come into consideration when choosing sheet masks, or do you just go for the nicer scents? I’ve never heard about them so I will try it with pleasure! They’re some of my fave masks – I highly recommend them! The Face Shop is a brand I really enjoy using! I’ve never tried their face mask, but I love the design on the packaging! I haven’t tried their sunscreen yet but I’ve heard great things! I’ve tried the nivea mens aftershave balm and it works pretty well! These sound really interesting, I had already guessed that the different purposes probably wouldn’t make any difference! Thanks for the review! I saw them at stores and was thinking about it, but I have a lot of sheet masks at home already. Will definitely haul on these when there’s a store sale! Thank you for such a wonderful article dear and from my side I want to say that i am using coconut oil facial mask from long and its really effective. SheaMoisture’s Coconut & Hibiscus Facial Mask with Songyi Mushroom extracts helps restore moisture and gives dull, dry skin a bright, even tone. Coconut Oil will blended in this intense hydration formula to help soften and condition your skin. The smell is not strong like the other ones and that's another point for me. I actually really love this line… I agree with you the scent is mild and doesn’t give you a headache, the gloopyness isn’t there either. I used a few, didn’t notice a big difference in my skin but it does hydrate it. They are a fave of mine too. Great review and post.